Earlier this year my brother and I went to a small county fair. We were hoping to bring a Christian presence to the event, and did so through a great apostolate known as St. Paul Street Evangelization. As we had many conversations that day, we were able to encounter a wide array of people. We obviously realized that this woman was not Catholic, which she confirmed. She called herself a “non-denominational” Christian, and we politely asked what she meant by her statement. It turns out she has an opinion similar to that of many Protestant Christians. While Catholic and Orthodox Christians have no issue depicting our Lord’s Passion, many of our brothers and sisters do have a problem with such a depiction. Her concerns prompt an important question: Why do we depict Christ crucified? As we’ll see here, Sacred Scripture directs us to “preach the crucified Christ” (see 1 Corinthians 1:23, and 1 Corinthians 2:2), and our feelings would be misplaced as Christians if we shirk from acknowledging the significance of this image of our Lord. As we continued talking, it became clear that our interlocutor saw the crucifix as a denial of the Resurrection. “Jesus is alive now; we shouldn’t depict him on the Cross,” she said. While my brother and I agreed that Jesus is alive, as he is the living God, we heartily disagreed with the second part of her objection. My brother paraphrased the words of St. Paul, but unfortunately she did not wish to have anything more than a passing conversation, and then she went on her way. There were many other things we would’ve liked to have pointed out to her, all of which were based in Scripture. If we look to the letters of St. Paul in the New Testament, we have a very clear directive from him on this very subject. What’s more, we can easily connect the dots of his words to other portions of Sacred Scripture, namely those words which were uttered directly by our Lord Jesus. “For Jews demand signs and Greeks seek wisdom, but we preach Christ crucified, a stumbling block to Jews and folly to Gentiles, but to those who are called, both Jews and Greeks, Christ the power of God and the wisdom of God. For the foolishness of God is wiser than men, and the weakness of God is stronger than men” (1 Corinthians 1:22-25). “We are afflicted in every way, but not crushed; perplexed, but not driven to despair; persecuted, but not forsaken; struck down, but not destroyed; always carrying in the body the death of Jesus, so that the life of Jesus may also be manifested in our bodies” (2 Corinthians 4:8-10). The gates of heaven would’ve still been closed without Jesus’ death. This is why these seemingly contradictory words are so true. We carry in our bodies the death of Jesus so that his life may be manifested in ourselves. At that moment when our Lord cried out “It is consummated”, he had completed what he set out to do. He had redeemed mankind, giving us life through death. His Resurrection shows us that not even death had power over him. Jesus, being true God as well as true man, shows us that by his power, we too will conquer death. His glorified body gives us hope that we will have the same glorified body after our own deaths. But the only way we can get to that resurrection is to follow in our Lord’s footsteps. Moving from the words of St. Paul, let’s see what Jesus has to say directly. “If any man would come after me, let him deny himself and take up his cross and follow me. For whoever would save his life will lose it, and whoever loses his life for my sake will find it” (Matthew 16: 24-25). The Cross is never empty. Either we see our Lord suffering upon it or we make up what is lacking in his sufferings (see Colossians 1:24) by embracing the Cross ourselves. When we gaze at the crucifix, we see that Christ himself took up his cross and was nailed to it. We have the perfect model before us. He told us to do something, and he himself did it. 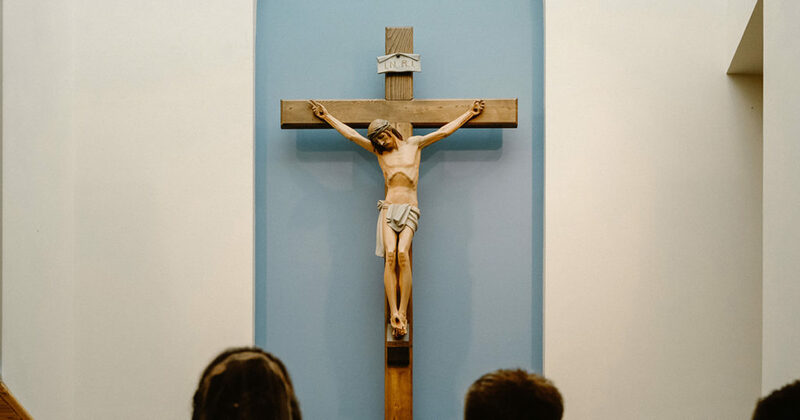 However, looking upon a crucifix should also cause us to realize that Christ was an innocent victim, taking our own sins upon himself so that we might live. How beautiful is that! Instead of becoming indignant at seeing Christ on the Cross, we as Christians should become joyful. Yes, to see Christ crucified is a scandal, in a sense. We want to turn away. We don’t want to look at the gruesome torture that our Lord undertook. What is the real reason we turn away? Could it be that we are ashamed of our sins, and we don’t want to look squarely at what our sins did to our Lord and our God? But if we do look carefully at the depiction of Christ expending himself, instead of being disgusted, we find ourselves contemplating the love of a friend. “This is my commandment, that you love one another as I have loved you. Greater love has no man than this, that a man lay down his life for his friends” (John 15:12-13). “You are my friends if you do what I command you. No longer do I call you slaves, for the slave does not know what his master is doing; but I have called you friends, for all that I have heard from my Father I have made known to you” (John 15:14-15). Take some time to reflect on that. You, as one of the baptized, have been called a friend by our Lord Jesus. We aren’t merely followers. We aren’t simply servants. We are called friends of Almighty God. How humbling such a thought is, that Jesus would declare us to be his friends! And because of this one fact, that is precisely why we as Catholic Christians put the crucified Lord front and center in our churches and in our homes. The Crucifixion is the epitome of love. The Crucifixion is the love a man has for his friends. It’s not revolting. It’s not macabre. When I contemplate and look upon this image, I am filled with love and appreciation. I see something beautiful. I see that God loved me, a sinner, enough to die for my redemption. This is precisely why we preach Christ crucified. We are the friends that he laid his life down for. Seeing the Cross reminds us of that love. It reminds us of the suffering he endured. What does the empty Cross do? If the Cross stands alone, then we might forget that we have to suffer alongside Christ. We fall into a comfortable Christianity that forgets about picking up our individual crosses. But when we have that image of Christ suffering in front of us, we remember the words of Sacred Scripture that we’ve called to mind here. It’s not easy to be Christian, and if it ever is, then something is wrong with our mentality. But despite the tribulations we may encounter for being a disciple of Christ, we find solace in knowing that our sufferings have been elevated to something truly greater than what we could ever accomplish on our own. “Man, discovering through faith the redemptive suffering of Christ, also discovers in it his own sufferings; he rediscovers them, through faith, enriched with a new content and new meaning. This discovery caused Saint Paul to write particularly strong words in the Letter to the Galatians: ‘I have been crucified with Christ, it is no longer I who live, but Christ who lives in me: and the life I now live in the flesh I live by faith in the Son of God, who loved me and gave himself for me.’ Faith enables the author of these words to know that love which led Christ to the Cross. And if he loved us in this way, suffering and dying, then with this suffering and death of his he lives in the one whom he loved in this way; he lives in the man: in Paul. And living in him-to the degree that Paul, conscious of this through faith, responds to his love with love-Christ also becomes in a particular way united to the man, to Paul, through the Cross. This union caused Paul to write, in the same Letter to the Galatians, other words as well, no less strong: ‘But far be it from me to glory except in the Cross of our Lord Jesus Christ, by which the world has been crucified to me, and I to the world'” (SD 20). Reflecting upon the image of the crucified Lord enables us to remember that we as Christians have been crucified to the world, just as Jesus was. Again, there can be no resurrection without death. That includes dying to self and dying to the world. This is what we take on when we follow Christ. But as mentioned above, we have the perfect model before our eyes. So if anyone ever tells you that you’ve erred in “keeping Christ on the Cross,” tell them that the true error comes in not recognizing that the image of Christ on the Cross is true love. That was the act by which we were saved. That was the act that made the Resurrection possible. You can’t disconnect the Crucifixion from the Resurrection. They are inseparable. It’s not either/or, but instead both/and, as most things are within the Catholic Faith. All I see is the love God has for man when I look upon the Cross. Why would I want to turn my gaze away from that? I am so thankful that our Lord would do this for me, and this single action that redeemed me is something that I always want to keep in front of me. Nicholas is a twenty-something cradle Catholic who wears many hats, (husband, father, tradesman, religious education catechist, liberal arts college graduate, et al.) and hopes to give a unique perspective on life in the Church as a millennial. His favorite saints include his patron St. Nicholas, St. Ignatius of Loyola, St. Thomas Aquinas, St. John Mary Vianney and St. Athanasius of Alexandria. He currently writes for the Diocese of Joliet’s monthly magazine, Christ Is Our Hope. Thank you for this. I can’t help but notice today (Good Friday, 2019) that a number of my evangelical firends have made a point of the empty tomb, and “Jesus lives”. Where is the reflection of the act that made the resurrection possible? Where is the “fellowship of suffering” that we are called to? Where is the patience, evidence of the fruit of the Spirit? The lenten journey is a holy one and is lived one day at a time. Two of those days are Good Friday (passion and death) and Holy Saturday (the sealed tomb) and then comes the joy found in Easter Sunday.